HIERAPOLIS (Cyrrhestica) AE24. Antoninus Pius. VF+/EF. Legend in Wreath. Obverse: ΑΥΤΟ ΚΑΙ ΤΙ ΑΙΛ ΑΔΡΙ ΑΝΤωΝЄΙΝΟС СЄΒ ЄΥС. Laureate, draped and cuirassed bust right. Reverse:ΘЄΑС СΥΡ / ΙΑС ΙЄΡΟΠΟ / Β. Legend in three lines within wreath. 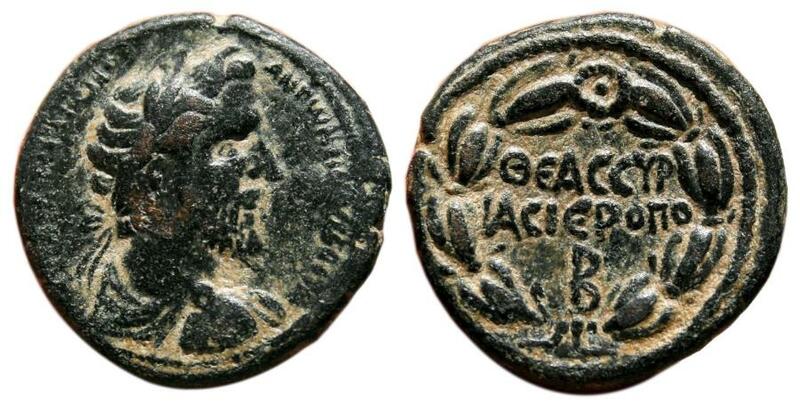 Very nice roman-provincial bronze, in VF+/EF condition, conserving very complete motives and legends in both sides. Precious dark green patina totally natural. ELAGABALUS AR Tetradrachm. EF/EF-. Original SHINE. Antioch mint. VERY SCARCE IN THIS CONDITION!!! ELAGABALUS AE20. EF/EF+. Antioch mint. SC - Wreath. MACRINUS AR Tetradrachm EF-/EF. Emesa mint. Letter A to the left of Shamash´s head. VERY RARE and NICE! CARACALLA AR Tetradrachm. EF+. Antioch mint. Eagle over Leg and Thigh.